From September 2013 to March 2014 the Dortmunder U presents the NEW INDUSTRIES FESTIVAL in cooporation with the Hartware MedienKunstVerein, the TU Dortmund University, the U2_Centre for Cultural Education and Urbane Künste Ruhr on the premises of the Dortmunder U and in the surrounding urban space. Through various formats including exhibitions, installations, lectures, workshops, film screenings and performances, this four-month-long international festival explores the past, present and future of industry. The structural changes in Europe’s former industrial regions such as the Ruhr, Northern England, Belgium and Upper Silesia epitomise the transition of societies from industrial to knowledge- and service-based societies and the so-called “creative classes”. 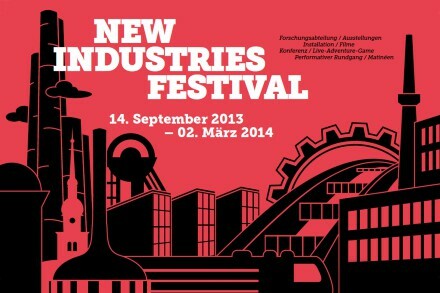 The NEW INDUSTRIES FESTIVAL asks how we became what we are, how industry marks our lives today, and how individuals can influence or appropriate the mechanisms of the industrial and working world. Only freely circulating money would keep the economy going – this is the view promoted by the films of the American Marshall Plan which boosted the reconstruction of Europe after 1945, declaring the increase of productivity and international trade as prerequisites for progress and prosperity. Since capital movements began to be deregulated in the 1970s, real profits are no longer made in industrial production – and hence through work – but on the financial markets, where money is exchanged for money to produce new money. From Industry to Industrial presents a series of historic and contemporary promotional, documentary and experimental films and videos. Among the subjects it addresses are oil, coal and steel as historic drivers of modernisation, the relationships between men and machines, the capitalisation of cities and the artists’ take on the rise and fall of western industrial societies.